Bob Popovics is the founder of the Atlantic Salmon Saltwater Fly Rodders, advisory member of TFO rods, a member of the Renzetti Legacy Tying Team, associated with Tibor Reels and a Freshwater Fishing Hall of Fame and Catskill Fly Fishing Museum Hall of Fame inductee. Though he has refined his fishing techniques and casting skills by traveling around the world, Bob is perhaps best known as a designer of lies (or ”fleyes,” as they’re called) and as a teacher. 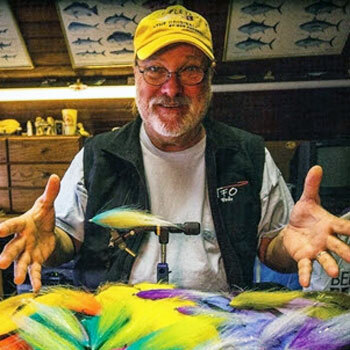 Bob Popovics is well known among salt water fly tiers to say the least and his designs are not only innovative but effective. The process of fly creation is a living, organic one and not a mechanical one for Bob, he doesn’t tie so much as he creates. If you’re looking for some tips on tying some great salt water patterns join us as we try to unravel Bob’s brain and get to the bottom of great fly creation. Starting with his famous Serf Candy pattern n the 1970’s, Bob’s innovative fly tying concepts helped pave the way for modern-day saltwater fly fishing in the Northeast. His epoxy and silicone flies were the first of their kind and anglers around the world continue to tie, fish, modify and study Bob’s creations, many of which were included in his bestselling 2001 book, Pop Fleyes, co-authored with Ed Jaworowsi. A patient teacher, Bob has helped countless tiers and anglers through his seminars, videos and writing. Though Bob’s specialty is fly fishing in the surf on his favorite Northeastern beaches, his famous patterns – like the Siliclone, BULKhead Deceiver, Bob’s Ranger and Hollow Fleye – have been adapted for a wide variety of fishing situations in fresh and salt water around the world. Bob and his wife Alexis, own and operate the Shady Rest Restaurant in Bayville, New Jersey and live in Seaside Park, New Jersey.